A world of beautiful colors comes alive in Pastiche as players choose commission cards picturing 34 of the finest European art works of the past six centuries. Players score their commissions by mixing primary colors through clever tile placement and recreating the palette of colors used by the masters who created these works. 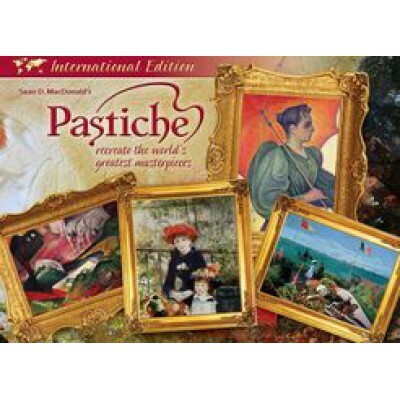 Explore the paintings, palettes, and pasts of the artists in this unique and challenging game for the whole family. While placing hexagonal pieces to gain palette (color) cards, players become familiar with the different color combinations that produce the many hues of an artist’s palette, all listed on the Player Reference Card. Players also learn to recognize many great artists and their works as they complete commissions. ● The inclusion of eight mini wooden easels. ● The size of the box is now deeper by 15mm. The box insert has been modified to accommodate the easels, along with deeper card cavities, and a clear plastic lid to cover everything. ● The rules are now available in English-only or in a 60-page rulebook that includes four additional languages: French, German, Dutch, and Italian. The rules feature some minor clarifications/corrections, are better organized, and include a two-page educational section on the history and nature of color theory and the color wheel. ● A new card has been added to indicate the First Player. ● Additional printing changes include: Bisque is now 5 points; all the cards total exactly the sum of their component cards; the palette board has been modified and now has a more rational and user-friendly layout; the 5 reference cards are slightly modified in layout for turn sequence & color exchanges.